So I grab a frozen dinner while mom is zombied out in front of Inside Edition, then get my bike out of the garage and head to Cameron’s. That’s right, the fat kid on a bike. Shocked? I know what you were thinking—fat and lazy, right? Nope. I’m a drama jock; we’re a rare breed, but we do exist. I do plays and play a varsity sport. I know, surprise, right? And no, I’m not a sumo wrestler. I play field hockey. And I don’t just play for fun and to get out of gym class—I’m good. I’ve started on varsity for two seasons now, and we were undefeated last fall. Something about having a stick in my hand brings out the animal in me. Miss O’Brien, who in addition to being the college counselor is also our field hockey coach, is always lecturing us about being more aggressive. “Except you, Agatha,” she says, “you’re aggressive enough.” Damn right. So now you’re thinking “glutton,” and honestly, I like ice cream and pizza as much as the next person, but not any more than the next person, and a lot less than Cameron and Elliot, who can each eat enough to feed a small Albanian village and still look like an ad for famine relief. So call me big-boned or well-endowed or voluptuous or any of those other euphemisms—even call me fat. I embrace “fat.” I am fat. Just don’t call me overweight—because if I’m “overweight,” then that means there is some ideal weight that I should be, and I’m not buying that one. I exercise, I eat reasonably healthy food, and I’m fat. So when somebody tells me “you should lose weight,” I want to say, “you should become Asian.” It’s who I am, OK? Deal with it. "Unlike most arcs about fat teens, this one never equates emotional growth with weight loss; Aggie's refreshingly non-symbolic fatness is just part of her....Given the ratings of Glee and the emerging popularity of teen lit combining queer themes and musicals, this should be a hit." "As a writer and publisher of plays for teens, I greatly appreciate Charlie Lovett's richly developed characters. 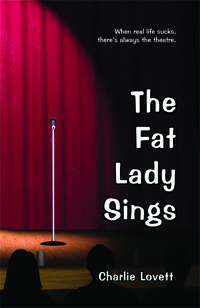 The Fat Lady Sings leads you on a journey of self-acceptance, whether you are a teen or remember what it was like to be one. This book carries its audience of readers to a theatre stage—or perhaps it's a stage of life—and beautifully illustrates how to feel comfortable with yourself, both inside and out." "A palpable hit! Charlie Lovett's new book is saucy, smart, heartfelt, & very funny. The author must have been a teenage theatre lover himself to have captured the offstage "drama" of the teen theatre world so vividly. Fans of Glee, Wicked, & Hairspray will eat this up. There may need to be a sequel, and perhaps—a musical!"